Home » A Kyrgyz in traditional dress on Horseback. THE Kyrgyz call themselves Sara-Kaisaki, or Kosacs of the desert. If we may trust their traditions, they originally came, in small numbers, from the Crimea, and were soon after much increased by numerous emigrations from different hordes. If this account were true, we should consider them as descended from the Nogais Tartars: but Abulgasi, who calls them Kyrgyz, traces them from the banks of the Ikran, in the neighbourhood of the great wall of China. As this people were not known till after the conquest of Siberia by the Russians, we can have no certain account of their ancient history. They are divided into three distinct hordes. The Great Horde wander in the desert watered by the Syr-Daria towards Tourkestan: the Middle, and Small Horde, more numerous, and richer than the former, extend from the coast of the Kargaljin lake, and the banks of the Noura and the Sourassou, as far as lake Aral and the borders of the Caspian Sea. The Kyrgyz lead a wandering life, and dwell entirely in tents, constructed nearly like those of the Kalmucks. Their riches consist in cattle. A pastor moderately affluent seldom possesses fewer than from thirty to fifty horses, from fifteen to twenty oxen, about a hundred sheep, and from twenty to fifty goats, to which may be added a pair of camels. In general, the Kyrgyz lead an easy life, and have a lesser share of misery. than almost any other of the wandering nations. They have no idea of tilling the ground, and even if they were so inclined, the barren and saline quality of the soil of their deserts would be very unfriendly to cultivation. The commerce which the Kyrgyz carry on with the Russians, Buekarians, Chinese, and other neighbouring nations, supplies them with every article necessary for satisfying their vanity, They devote themselves to fishing and hunting, merely for their amusement. They use an immoderate quantity of tobacco, which they smoke in small Chinese Pipes; but as these pipes arc dear, they commonly supply their place with the bones of sheeps feet. The Kyrgyz dress in the Oriental Costume; but their clothes are generally better than those worn by the other Tartars, the men shave their heads, and leave their whiskers to grow, and also a small tuft on the chin. Their summer dress is generally of goats’ skin, which they have an excellent method of preparing and dying of a yellowish brown. 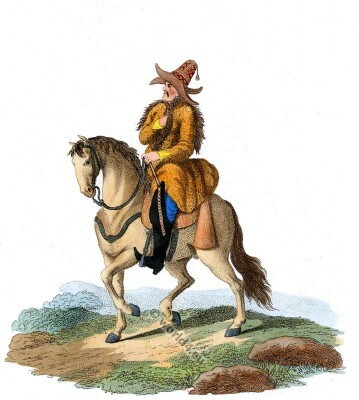 Particular in their own apparel, they arc not less so of theirs horses, which are richly caparisoned; the saddles are worked in the most costly manner with silver and gold, and the very bridles are loaded with ornaments. This entry was posted in 1803, 19th Century, Asia, Russia, Traditional and tagged Edward Harding, Russian national costumes, Traditional Kyrgyz Folk Costume on 11/5/14 by world4.